I was poking around my external hard drive the other day when I realized that I have about a gazillion short bits of video footage just sitting in a folder. These are snippets I’ve shot on my travels all over the world, in hopes of one day doing something with them. Some of them have been waiting to see the light of day for months, others for years. Well, that day is here. 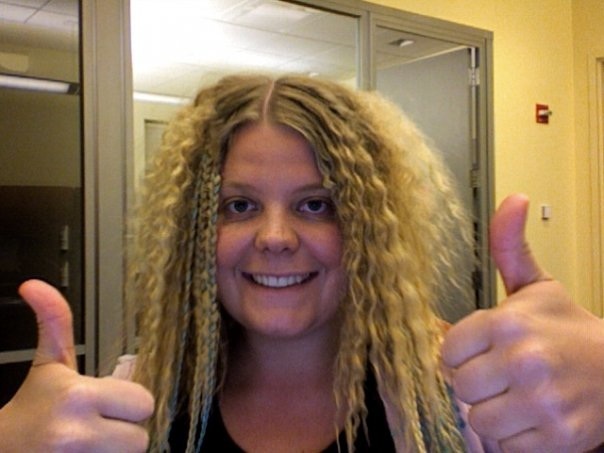 I’m starting a new blog series called the Weekly Wednesday Video. So every Wednesday I’ll be posting a short travel video of mine, shot in some random country. The first flick comes from South Korea and features a cat cafe that I visited last October. It basically shows you what it’s like inside this cafe that is home to 50 cats. As you’ll see, sometimes tension builds up between the furry residents. My apologies for the quick moving camera work in the end of the video – I just wanted to give everyone a better idea of the decor of Y-Cat cafe in Seoul, Korea. 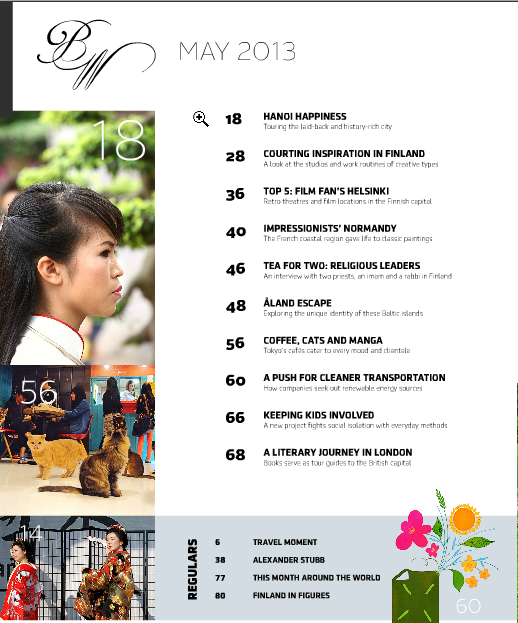 The video is actually pretty timely right now, as my article about the history of cat cafes is out in the May issue of Blue Wings, Finnair’s in-flight magazine. (Well, more than an actual article, this is a short side bar to someone else’s piece that talks about Japan’s cafe culture. But nonetheless.) If you view the video, you’ll surely recognize some of the cats that make an appearance in these Blue Wings photos as well. 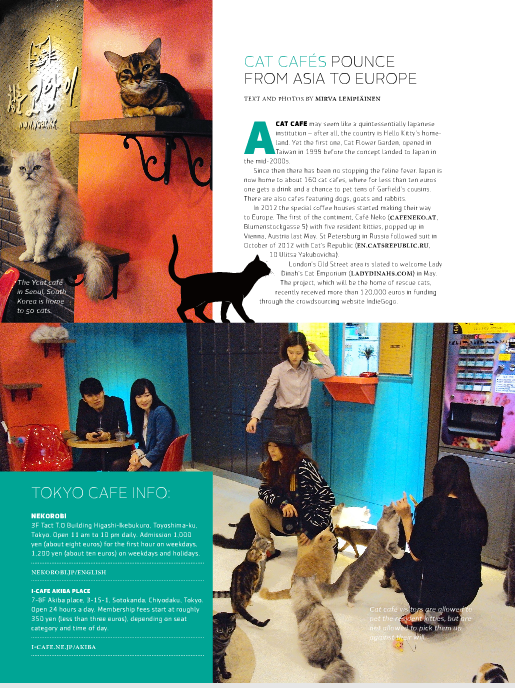 A cat cafe may seem like a quintessentially Japanese institution – after all, the country is Hello Kitty’s homeland. Yet the first one, Cat Flower Garden, opened in Taiwan in 1998 before the concept landed to Japan in the mid-2000s. Since then there has been no stopping the feline fever. Japan is now home to about 160 cat cafes, where for less than ten euros one gets a drink and a chance to pet tens of Garfield’s cousins. There are also cafes featuring dogs, goats and rabbits. In 2012 the special coffee houses started making their way to Europe. The first of the continent, Café Neko (www.cafeneko.at, Blumenstockgasse 5) with five resident kitties, popped up in Vienna, Austria last May. St Petersburg in Russia followed suit in October of 2012 with Cat’s Republic (en.catsrepublic.ru, 10 Ulitsa Yakubovicha). London’s Old Street area is slated to welcome Lady Dinah’s Cat Emporium (LadydinaHs.com) in May. The project, which will be the home of rescue cats, recently received more than 120,000 euros in funding through the crowdsourcing website IndieGogo.